Below is an outline of the current music policies from political parties in NSW, ahead of the state election on March 23. We will be updating this report card as more policies are announced. All of the below information is sourced from publicly available policies, positions and commitments from state parties. Did we miss something? Get in touch with us to let us know of any policy updates! Want to get involved? 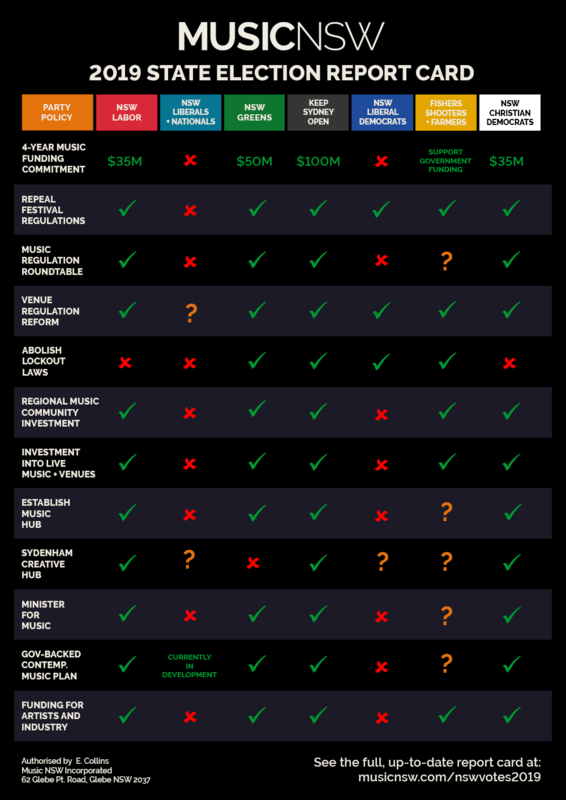 Check out our #VoteMusic action checklist and find out more about the state election! Want to spread the word about our report card? Download a social media friendly version here! $35M to support contemporary music in NSW over four years. $50M to support contemporary music in NSW over four years. Support for the 60 recommendations from the Parliamentary Inquiry into Music, which includes matching funding, per capita, for contemporary music with that of the Victorian Government over the next four years. $100 million in state funding for contemporary music over four years, quadrupling Victoria’s investment to become Australia’s cultural capital. The Liberal Democrats will cut state taxes to leave punters with more money with which to support music. Support the government's funding commitment to the music industry. Ensure MusicNSW is adequately funded to support contemporary music. Support the funding of MusicNSW by Create NSW to establish a Music Development Office. Support the funding of MusicNSW by Create NSW to develop and implement, in conjunction with music industry stakeholders and Destination NSW, a marketing campaign that encourages people to attend live music gigs and events. Support the funding of MusicNSW by Create NSW to conduct a live music venue census every two years. Support the funding of MusicNSW by Create NSW to support a NSW Music Crawl and take music industry professionals into regional areas to showcase regional venues, artists and local industry. Support the funding of MusicNSW by Create NSW to engage Regional Music Champions to support the revitalisation of New South Wales' regional live music scene. Support the funding of MusicNSW by Create NSW to, in collaboration with the music industry, conduct a public awareness campaign to inform musicians and venue operators of their rights and responsibilities in relation to pay and performance conditions. Investigate options for a cultural hub that co-locates the Music Development Office, contemporary music organisations and businesses, rehearsal and performance space, community radio, writing and recording studios and a youth venue in Inner Sydney. A contemporary music hub with collocated facilities for rehearsal, performance, recording, production and radio providing a platform and community focal point for the local industry. Support for the proposed Sydenham Creative Hub. Investigate options for a cultural hub that co-locates the Music Development Office, contemporary music organisations and businesses, rehearsal and performance space, community radio, writing and recording studios and a youth venue in Inner Sydney. Support for the NSW Government to consider the state significant nature of the Sydenham Creative Hub proposal if the Inner West Council continues to refuse approval. Create a $5.1M Band Aid program to help musicians records and tour regionally and nationally, and for industry professional development. Establish a $1.3M Music Passport program to help musicians from NSW to tour internationally, developed in consultation with Sounds Australia. Invest $3M into grants for live music venues for promotion, soundproofing and infrastructure such as audio and lighting equipment. $1m in live music grants through Create NSW's Music Now funding program (closed 14 March 2019). Provide $200 million to Create NSW to ensure our state is an attractive destination for all those passionate about arts, culture and music. Support Create NSW to collaborate with existing industry organisations such as the Live Music Office and MusicNSW in determining the allocation of funding for government programs related to music. Support that as a part of a contemporary music strategy, the allocation of funding should be determined by music industry organisations, with appropriate oversight from Create NSW. NSW music grants to improve the dynamism of NSW’s contemporary music scene, through grants for venue infrastructure, soundproofing and promotion. Music quick-grants to help artists and organisations take advantage of career opportunities that arise at short notice and outside of the major grants process. This would include funding for touring and recording, and for professional development. Allocate $10 million to a ‘Street Party Fund’ to activate public spaces with street festivals. Cut state taxes to leave punters with more money with which to support music. Recurrent annual funding of Create NSW to ensure long-term support and viability of the live music industry in NSW. Support a funding program for artists and industry. • Introduce a new class of licence specifically for venues dedicated to live entertainment. Create a one-stop shop for both venues and residents to deal with noise complaints, and streamline the complex regulations that govern noise from live venues. Create a one-stop shop for planning and liquor approvals to streamline the approval process for venues. Convene a regulatory reform roundtable to consult on recommendations to introduce an “agent of change” principle and designated Entertainment Precincts into the planning system. Establishment of an expert advisory panel to advise NSW Government of better ways to integrate liquor and planning approvals. Trial for a new licence for pop-up bars and events to support the activation of local spaces in designated precincts, and diversify the social-cultural and business offerings in the Night-time Economy. Don't support abolishing lockout laws. Remove the liquor licence freeze which is preventing new clubs from opening. Abolish the 1:30am Sydney lockout laws. Streamline liquor licensing approvals and development consent processes. Remove oppressive and outdated licensing conditions and security requirements that stifle creativity. Introduce a separate class of liquor licence for live music venues with lower fees and compliance costs. Create a new class of licence with lower fees for venues offering cultural and performance space. The Liberal Democrats oppose lockout laws and would abolish them. The Liberal Democrats oppose creeping noise restrictions prompted by new residents of areas with pre-existing live music venues. The Liberal Democrats support cutting the red tape of liquor licensing, to make it easier to run a venue and in recognition that most punters are not problem drinkers. Support the live music and entertainment sector by overturning draconian and stifling laws. Review and amend liquor legislation to remove outdated conditions for liquor licences and development applications that place unnecessary restrictions on certain entertainment live music venues, such as prohibiting music genres or specific musical instruments. Remove the duplication of regulatory and compliance responsibilities from multiple government agencies and local government. Introduce live music venue liquor licences. Amend the Protection of the Environment Operations Act 1997 to include an objective test for 'offensive noise' from licensed venues. Support the development by the NSW Department of Planning and Environment of guidelines for exempt and complying development and ancillary development that provide clear examples of the type of cultural activity that may take place in a venue, without the need for development consent. Appoint a Minister for Music and Night Time Economy as well as a Night Life Commissioner. The NSW Greens currently have as part of their Arts and Creative Industry policy portfolio, a Night Time Culture and Economy portfolio spokesperson who is Jenny Leong MP, Member for Newtown. Support the appointment of a Minister for Music, the Arts and Culture in place of the Minister for the Arts, or appoint a Minister for Music in addition to the Minister for the Arts. A dedicated NSW Government office that serves as a focal point for leadership, coordination and accountability for live music and the night time economy and a Ministry of the Arts, Culture, Music and Nightlife for a seat in cabinet. The Liberal Democrats support the appointment of a minister for cutting red tape, who would do more to promote music than any other minister. Ensure Create NSW employs a senior contemporary music expert. Support the employment by Create NSW of at least one senior ongoing full-time contemporary music specialist, and that this role be responsible for consulting with industry and administering funding for contemporary music programs. The Liberal Democrats will not micromanage Create NSW. Support awareness campaigns regarding the importance of musicians receiving fair pay, including the development of an Industry Code of Conduct. Support the Australian Live Performance Industry Code of Practise to Prevent Workplace Discrimination, Sexual Harassment and Bullying developed by the Media Entertainment & Arts Alliance and Live Performance Australia. Support Create NSW to adopt an industry code of conduct that is developed and endorsed by the Media Entertainment Alliance and the music industry, and that includes an outline of the minimum hourly rate requirements. Support that when NSW Government funding is being applied to the sector, in principle a minimum payment threshold set out in the Industry code of conduct be applied. Appropriate on-going funding to Support Act to facilitate their work in supporting musicians and music industry workers, particularly in regards to their mental health. Support Create NSW to collaborate with Spotify to develop and implement workshops for NSW artists to better understand how to use streaming services to assist them to promote their music, reach new fans and utilise streaming data to identify the geographic areas where their fans are most concentrated. The Liberal Democrats will cut state taxes to leave punters with more money with which to support artists and the industry. Support the engagement of local groups and live performances at major NSW government-sponsored sporting, cultural and civic events. Support that as a part of a contemporary music strategy, Create NSW contribute appropriate funding to Sounds Australia to support the export of music from NSW. NSW music passport to help individuals and organisations establish global links, learn world’s best practices and break into overseas markets, including grants to help NSW musicians tour internationally. The Liberal Democrats will cut state taxes to leave potential exporters with more of their own money to pursue their aspirations. Conduct a Live Music census every two years to establish the number of venues, musicians and performances that take place at any given time in NSW. Provide $5 million to assist venues with sound proofing, including retrofitting existing venues to protect them from noise complaints. Support Create NSW and the Cultural Infrastructure Program Management Office to reflect on the factors that contributed to the closure of The Basement and consider opportunities to support and enhance Sydney's small to medium sized venues. Support the NSW Department of Planning and Environment to investigate the viability of identifying NSW live music venues as 'assets of community value', similar to the approach taken in London. Fund Create NSW to provide grants of up to $25,000 to assist live music venues to install noise attenuation measures. Implement targeted tax offsets for live music venues to breathe new life into the scene. Launch a $250 ‘culture pass’ with free access to live music and performance, theatre, galleries, club nights and other cultural events and institutions for the ‘lock-out generation’ who are now 18-24 years old. Conduct a performance venue audit every two years, identifying culturally significant venues and protecting them as assets of community value and cultural heritage. Protect venues from noise complaints by embedding the ‘agent of change’ principle into regulation. Mandatory soundproofing and insulation in all new developments and redevelopments near existing venues. Cut state taxes to leave punters with more money with which to support live music. Support recurrent annual funding of Create NSW to ensure long-term support and viability of the live music industry in NSW. Establish a permanent Night-Time Economy Roundtable to develop policies which encourage a vibrant and safe night-time economy. $500k in grants for "one-off unique ideas that encourage a vibrant night-time-economy" through the Office Of Responsible Gambling's 2019 Activate Sydney@Night Grants (closed 28 February 2019). No future funding commitments. Ensure that NSW Government policy affecting the night-time economy includes balanced provisions that support the establishment and operation of cultural infrastructure, such as live music venues. Create a night-time economy planning taskforce to review and amend our planning laws to provide greater flexibility for music and other cultural venues to operate. Reformation of licensing laws with respect to changes in opening hours and density of outlets to put the onus on licensees to prove that such changes will not adversely affect public health and safety. Reformation of the laws to also favour venue types, for instance small bars, which are less likely to encourage rapid consumption of alcohol which is linked to increases in alcohol-related crime. A dedicated NSW Government office that serves as a focal point for leadership, coordination and accountability for live music and the night time economy. Work with city councils to extend trading hours of other businesses that are integral to the night-time economy. Conduct a review of alcohol-free zones and restrictions on serving alcohol outdoors, and pare back regulations where the risk of harm is low. Develop new entertainment and late-night trading precincts where culture and entertainment are prioritised over residential land use, with soundproofing mandatory on new residential developments. Support for the reinvigoration of night-time economies. Support for the Department of Premier and Cabinet to assume responsibility for policy related to supporting and enhancing the night-time economy, including coordination of the Sydney Night-Time Economy Taskforce. Demand that the NSW Government complete and publish the night-time economy master plan. Support the revision of definitions in the Standard Instrument – Principal Local Environmental Plan to provide the greatest level of flexibility to allow cultural activities across all relevant zones. Support the engagement by Create NSW with local government through the NTE Councils' Committee (NTECC), on how State and Local Government can collaborate to support the development of more music, arts, creative and theatre spaces to grow our cultural infrastructure. A Plan for Contemporary Music to be released within first 100 days in office. Support for the NSW Government to develop a contemporary music plan for NSW. The Greens support NSW government funding for increased and secure funding for music festivals; Aboriginal and Torres Strait Islander arts; accessible and affordable music education, including in the regions, to ensure there is better alignment of educational outcomes and industry needs and ongoing funding for community radio and television. The Greens support funding for arts workers and musicians, such as those involved in funded projects, grants and one-off hire, are paid to account for skills, rehearsal and travel as well as performance time. Development of a State Government vision for nightlife, contemporary music and culture to which the Government can be held accountable. Cut state taxes to leave punters with more money with which to support contemporary music. Demand that Create NSW immediately complete and release its strategic plan for contemporary music. Ensure any new license process is streamlined so that approvals are provided in a timely manner. Multi-year approvals for event organisers with an established record. Remove draconian regulations that restrict live music festivals. Repeal the new festival licence regulations to be brought in by the NSW Government on 1 March that would decimate the festival industry. Initiate a roundtable on music festival regulation led by festival operators, music industry representatives, health and safety specialists, drug policy experts, police and government. The Liberal Democrats oppose the recent increase in the regulatory burden on music festivals. Support repealing music festival regulations. Commit to holding a drug summit with police, addiction specialists and other stakeholders to consider all harm-minimisation options. Establish an independent drug regulatory authority to develop evidence-based and continuously evaluated policies and programs for safer drug use. Fully fund mandatory emergency services and counter-terrorism strategies for sport, festivals and cultural events. Standardise the ratio of police and security to attendees at festivals and the bring costs into line with other cultural and sporting events. Introduce a harm minimisation program for festivals covering pill testing, amnesty bins, drug education, health services and water stations. Replace fines and criminal penalties for personal drug use and possession with diversion notices to educational and treatment programs. Scrap the sniffer dog program and roll back police strip search powers. The Liberal Democrats support pill-testing. Provide $700,000 to the Sydney Fringe Festival. Restore funding to Festival First Night at the Sydney Festival. Increase funding to the Sydney Fringe Festival. Support the NSW Government, in collaboration with the City of Sydney, to investigate and identify a possible permanent festival site in Inner Sydney. Change the NSW Government’s advertising guidelines to place a greater share of NSW Government advertising on community stations where appropriate. Allocate funding to community radio stations to foster new music and meet the costs of building suitable broadcast infrastructure, either under a new community radio grants scheme or as part of the contemporary music funding package. Investigate opportunities to amend advertising guidelines to encourage government advertising on community radio stations, where appropriate. Provide funding for community radio. Fund a new youth music organisation to work with MusicNSW. Provide funding and support for more all-ages gigs to increase the events at which musicians and bands can play and to allow them to diversify their audience base. The Liberal Democrats supporting removing regulatory barriers to youth music venues and all-ages gigs. Support Create NSW to partner with local governments to facilitate music-based youth venues across the state that include 'plug and play' infrastructure, like the City of Sydney's new music room at the Green Square Library. Support Create NSW to work with MusicNSW to investigate opportunities to promote all-ages gigs across New South Wales. Support Create NSW to investigate opportunities to better support young people to engage in cultural activities, particularly music. Invest $4M to establish a new Music Industry Office. Expand support for ARIA Week and the ARIA Awards in NSW through Destination NSW. Create a NSW Music Week/Awards to specifically showcase musicians from NSW. Establish a Music Development Office to support emerging, small and medium arts and organisations to reinvigorate contemporary music in NSW. The Liberal Democrats will cut state taxes to leave punters with more money with which to support the music industry. Fund MusicNSW, through Create NSW, to establish a Music Development Office. Support Create NSW to collaborate with its Commonwealth counterparts to determine the viability of introducing a voluntary 25% Australian content quota for locally curated playlists on streaming services. Consider funding music conferences to engage with the international music and night time economy sectors. $10 million targeted marketing and promotion campaign to rebuild the confidence and reputation of the state’s nightlife and cultural offering. Cut state taxes to leave musicians with more money for promotion. Ensure funding guidelines to recognise that music is a powerful way to tell First Nations stories. The Greens believe that ?the unique and diverse character of Aboriginal and Torres Strait Islander peoples’ culture and heritage must be respected, protected, preserved and promoted. Cut state taxes to leave punters with more money with which to support indigenous artists. Support the development by Create NSW of specific funding programs for Indigenous musicians. Phase out poker machines restricting them to casinos, returning pubs and clubs to the community. Decouple clubs’ funding from pokies profits, by reducing tax breaks on mega clubs’ pokies profits and using the savings to help clubs diversify away from pokies revenue. Support cuts to gambling taxes. Support the NSW Government to develop a community benefit fund, similar to the fund operating in South Australia, that uses the revenue from gaming machines to support the live music industry. Establish a Live Music Roundtable convened by Create NSW that includes key government agencies and music industry stakeholders. Initiate a roundtable on music festival regulation led by festival operators, music industry representatives, health and safety specialists, drug policy experts, police and government. Establishment of an independent NSW Government office (‘Office of the Night’) as a focal point for leadership, coordination and accountability for stakeholders of the night-time economy. Support Create NSW to establish and convene a Live Music Roundtable in New South Wales, based on the Victorian model, that includes key government agencies and music industry stakeholders. Invest $10 million over 4 years to support music in the regions. Develop a program to help revitalise the live music scene in regional NSW. This would involve delegations of NSW’s leading music artists, managers and booking agents visiting regions to explore opportunities for contemporary music touring and collaboration. The Liberal Democrats will cut state taxes to leave punters in regional areas with more money with which to support music. Support investment into regional music community development. Support funding by the Cultural Infrastructure Program Management Office to ensure that regional conservatoriums are fit for purpose. Support the Cultural Infrastructure Program Management Office to make 'adaptive reuse and or regeneration' an eligible activity under the guidelines of the Regional Cultural Fund for the next three years and provide funding for upgrades to existing buildings to meet access, fire and safety requirements. Support additional funding to local councils to adapt current building stock to include 'plug and play' facilities. Support funding for Youth Rock. Work with the music industry to develop mentoring programs for music education at school, and as part of that trial the purchase of musical instruments for ten schools in Western Sydney or rural and regional NSW. Formally review the provision of music education in NSW. Support the NSW Department of Education and Training investigate opportunities to give prominence to music education in curriculums, and improve training for music teachers. Support taxpayer funding of schooling based on the disadvantage of the child, regardless of whether the school is owned by government or not. This would give parents more options to send their children to schools that recognise the importance of music education.